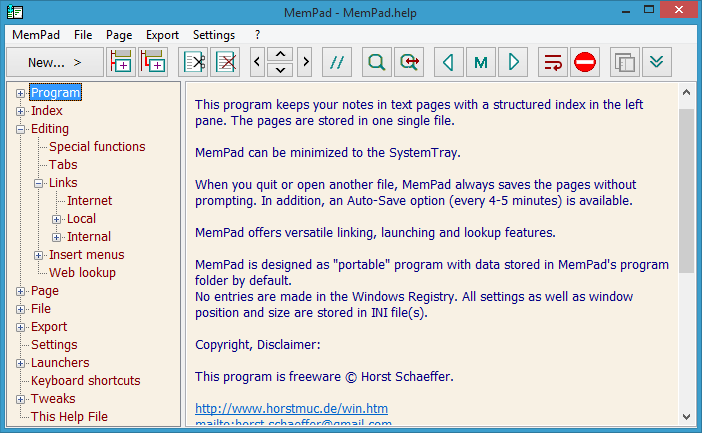 MemPad is a plain text outliner and note taking program with a structured index. All pages are stored in a single file. User interface available in 20 languages. Unicode. The program offers standard editing functions including cut, copy, paste, undo, date/time insert, drag&amp;drop, and supports Web links as well as network and local file or folder links (full path not required) and internal page links. Environment variables can be used in file links to run programs, for example. The index structure can be modified by buttons, context menu or hotkeys. Cut&amp;paste functions and quick node moving. MemPad always saves data without prompting (when closing Mempad or opening another file). Optional auto save (every 4 minutes). Automatic backup (can be disabled by option); restore last backup, reload file. Search through all pages or within a node; continue searching forwards or backwards; Replace. Options include: Selectable font, Background color, Minimize to System Tray, Hotkey, Always on top, ESC shortcut to quit or minimize. Popup menus with user defined words or expressions to insert, optionally with date and time tokens. Configurable Web look up (dictionary etc.) through context menu. Diary support with year/month/day index structure. Go to (or create) today's page with a key stroke. Export page, node or all to a file or directly to another program; import functions. Insert text file as page. Password protected encryption, optionally in Win98 compatible mode. MemPad operates in file environments (by extension and/or directory), each with its own INI file. No Registry entries. File/Open menu within a chosen file environment; optional "New Window". If you use Windows' built-in "Extract" function to unpack the downloaded ZIP file, first "unblock" the ZIP file (right mouse click, Properties / General tab, bottom). 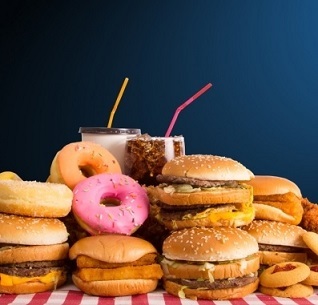 Otherwise, all files will be blocked by windows for security reasons, which may cause problems when opening the files. No problems when using other ZIP tools. Please install in a folder OUTSIDE "Program Files"! This portable program writes data to the program folder by default(*), however, this is not allowed within the "Program Files" structure. In this case Windows would redirect the data files of to a "VirtualStore" folder (under "Users"), however only for the 32 bit version of MemPad, not for 64 bit! (*) It is also possible to use a data folder of your choice (see help for more information). For a quick test of MemPad's features drag&amp;drop the "MemPad.help" file onto the MemPad.exe file. Read the Program/Installation section to get started. Note: The files from the "Example" subdirectory are required to test some advanced features in the help file. Please copy these files to the main directory. Links must be enclosed in <angle brackets> in order to be properly underlined and executed. Unzip the downloaded file into your existing folder. Your data will remain untouched. 421 693 Horst Schaeffer <img src="https://www.oldergeeks.com/downloads/gallery/thumbs/mempad1_th.png"border="0"> Oct 04, 2018 - 11:05 3.65 217.5KB ZIP , out of 8 Votes.